I was very saddened to hear of the death, today, of a great English champion of the faith - Denis Riches, the Founder of Family Publications and the husband of family and pro-life campaigner,Valerie Riches. He had been battling cancer since August 2005. 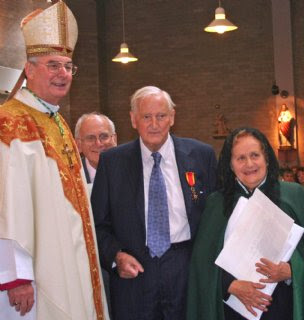 On 6 October this year he and Valerie were invested as a Knight and Dame of the Order of St Gregory (see picture), in recognition of their great work, and they also recently published their autobiography, Built on Love. As someone who has been involved with several of his publishing projects, I met Denis on numerous occasions and always benefitted from his wisdom and enthusiasm. He was a true Christian gentleman. Say a prayer for the repose of his soul and the solace of his family, who can be sure that his legacy will continue for many years in Family Publications. Very sad, and a terrible loss. RIP. A good and great man. His reward is surely assured.